Providing you the best range of fischer ea15 universal display device with effective & timely delivery. 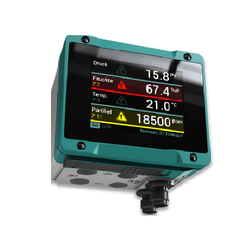 FISCHER can supply the new EA15 universal display device. With four analogue inputs and four analogue outputs, it is possible to display up to four process variables displayed simultaneously and store the data on a Micro SD card. Trend developments, limit value exceedances and the activation of the four integrated switching relays can also be visualized. The high performance electronics enables additional display options to be realized according to customer requirements. The micro USB port enables firmware updates and parametrizations to be carried out without difficulty and comfortably. The housing with the IP65 protection type also serves to expand the scope of use of the device. An additional typical scope of use can be the monitoring of production processes.